Happy 2013 to everybody!! I find December to be a hard month to work in the studio due to holiday distractions, so I focused this round on a website update. Very overdue, to be certain. My first thought was to switch to a Wordpress website, so I dutifully spent hours looking at themes and finally plunked down my dollars to buy one. Of course, being an original, artistic type, I didn't want what everybody else had, so I purchased something less common. Almost immediately it caused me grief, when I couldn't get it to behave properly on mobile devices. Yes, my note to the theme author was answered fairly promptly, but the notion that I would have to abide indefinitely by such arbitrary choices as no capitals in my filenames sent me back to the drawing board. Eventually, I decided to go back to writing my own HTML, and just learn what I need as I go. So I pared down the website to a minimum and started in again. Slowly, slowly, bits and pieces are getting ported over to the new look, although all the old glass and fiber work is present albeit hidden. HTML and CSS are getting less formidable. But now that 2013 has arrived, it's time to move back into the studio and start working on the major goals of the new year. So, please, leave me feedback on the new site and stay tuned for more updates. Hi Vicki. Just dawned on me that I don't think I've ever told you how special your work is. I appreciate your skill, and being finicky myself, I love how I can always tell if it's a 'vicki' piece:) LOVE your work. Keep it up. Thanks, Sue! That means so much coming from you, as I know you have really high standards. This is the year that I try to really take my work up another level and actually market my jewelry. I've learned so much from watching your adventures, even as you moved more away from jewelry. Having my own recognizable personal style is the easy part; business is the hard part for me. You seem to do both really well, so you have my admiration. Any advice you care to share would be extremely welcome! 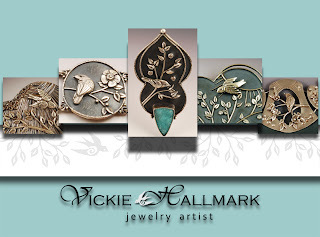 Hi Vicki - love the clean & bright signature look you have with your website & blog! Since you asked for feedback I have just two suggestions. When I go to your blog, the links at the top don't streamline with your main page's links so it doesn't feel quite integrated into your site. I.e. where can I get to your tutorials from your main site? They're great! Also on your Shop page, take out the Etsy general link - you're trying to sell your shop not everyone else's. And then put your Etsy shop header (or some picture) on it because at first I thought your "shop" was empty with just a couple of words on it. Keep up the great work, I'm planning on starting my website revamp very shortly too! Thanks so much for the feedback, Kim! It is a really new look that I'm slowly trying to spread across all my media. Yes, the blog is definitely not integrated into the website look yet. And yes, I have lots of content that is effectively hidden now because I haven't yet done the links and new page designs. I'm still grappling with how or even if to include everything that has been there over the years. Fiber? Glass? Do I remake myself as just a jewelry artist or do I keep that history? Great suggestion about changing the Etsy general link on my shop page. I didn't think about that happening when I put the shop in vacation mode over the holidays. Much better to put a image of some sort there that links. I'll put that at the top of my priority list.